Today we consider three fuzzy, fall caterpillars. Two are in the same family, Erebidae, a new-ish family that was created by reclassifying a bunch of Owlet, Tussock and Tiger moths. The other is in the Owlet Moth family Noctuidae. None is the famous Wooly Bear caterpillar, of previous BOTW fame) (remember, BOTW is archived at the UWM Field Station website). Some long-haired caterpillars have irritating/poisonous hairs, but the sources that the BugLady consulted underplay the “toxicity card” in connection with these three. That being said, always know what you’re handling before you pick it up. All three of these caterpillars show a lot of variation from individual to individual, and a caterpillar may change color from molt to molt. They all spend the winter as pupae. The BugLady didn’t find any mention of the adults’ feeding preferences, so they probably don’t feed at all. Until she started researching this American Dagger Moth caterpillar, the BugLady thought it was named for the caterpillar’s long, dark tufts of hair (setae), but it turns out that adults of many species of dagger moths have dark, dagger-like marks on their wings. Some dagger moths come with delicious names like the Delightful, the Fragile, the Funerary, the Afflicted, the Impressive and the Splendid dagger moth. Within the Owlet family Noctuidae, the ADM (Acronicta americana) is in the subfamily Acronictinae. Wagner, in his dynamite book Caterpillars of Eastern North America, says that Acronictinae contains “several of eastern North America’s most interesting and handsome caterpillars,” and that “the genus Acronicta has been remarkably successful, with more than 75 North American species, it ranks as our continent’s seventh largest genus of Macrolepidoptera (the larger moths and butterflies). Nearly 50 species occur east of the Mississippi.” Wagner also says that there are many food plant specialists in the bunch, some of which are named after their favorite plants. ADMs are at home in woodlands, especially swampy woodlands, east of the Rockies, where their caterpillars feed on the leaves of a bunch of common trees. First instar caterpillars skeletonize the undersides of leaves, but older larvae chew on the edges. Apparently, when they are finished eating, they sever the petiole (leaf stem) of a partially-eaten, leaf in order to get rid of it so it doesn’t signal their presence to birds. A pile of semi-chewed, partially-stemmed leaves on the ground may signal an ADM above. 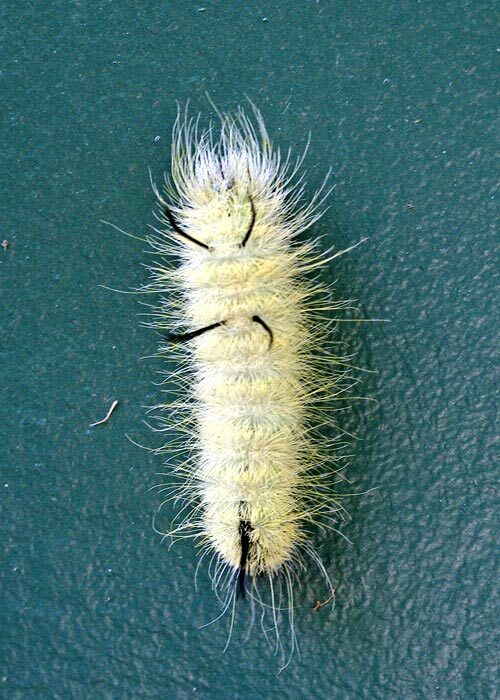 Except for those tufts of long, black hairs at each end, caterpillars tend to be yellow when young, and white or yellow later. One source mentioned minor skin irritation when handled by sensitive people. 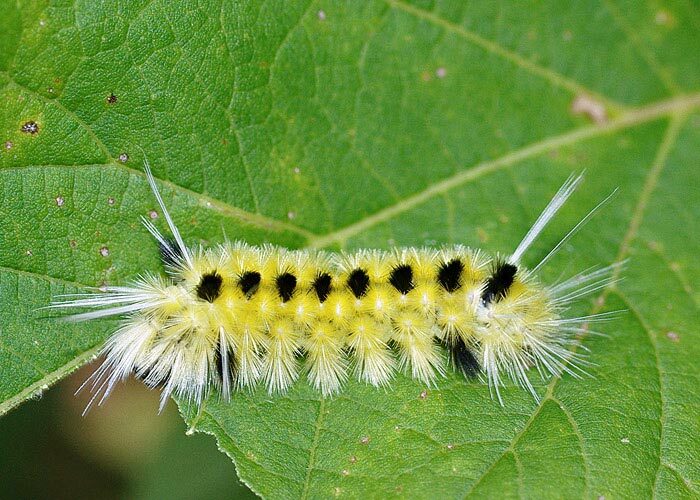 Written descriptions of the range of the Yellow-Spotted Tussock Moth caterpillar place it across Canada and our northern border/Great Lakes states. They also say that in the eastern U.S., its range skips from Massachusetts down into the mountains of North Carolina, where a disjunct population, a glacial relict, occurs. Driven south by the glaciers, the species was isolated when the ice sheets retreated. The BugLady couldn’t reconcile how a moth whose range includes Labrador could also be happy in southern California, and the range map at the Butterflies and Moths site, just adds to the confusion. YSTMs (Lophocampa maculata) are also called Spotted Tiger Moths and Mottled Tigers, and the “tussock” part of their name comes from the caterpillar’s clumps of setae. They’re found in woodlands and on the edges of swamps, browsing on poplar, willow, alder, basswood, maple, and oak leaves. Sogaard, in Moths and Caterpillars of the North Woods, says they are untidy feeders that, unlike the ADM, feed in the open and don’t seem to care much if birds notice the mess. This attitude, along with their coloration, suggests that along with the mechanical defense provided by all those hairs (most birds aren’t crazy about fuzzy caterpillars), they may have some chemical defense that discourages predators. Only one source cautioned us about urticating (irritating) hairs. 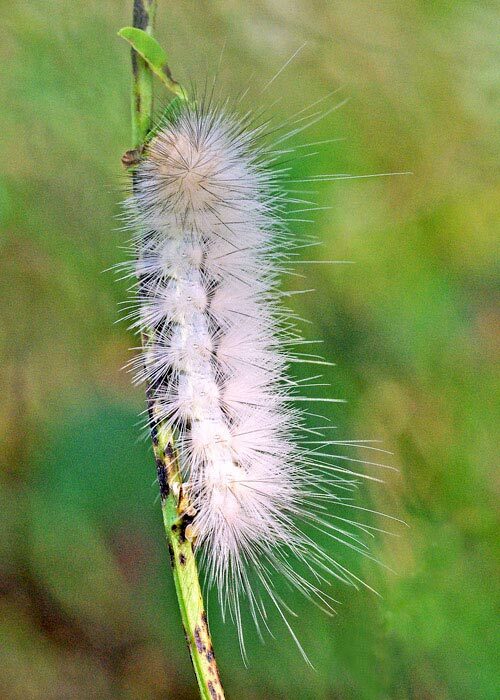 Well, the BugLady thinks that this is a Yellow Wooly Bear caterpillar (Spilosoma/Diacrisia virginiana) rather than the already-written-about Salt Marsh caterpillar, but the cut of their jibs is similar. If yes, alternate names are the Virginia Tiger moth and the Yellow Bear, in the family Erebidae. YWBs are found across North America north of the Rio Grande. The male YWB stalks females aerially, zigzagging through the night sky, searching with his feathery antennae for a trace of her pheromones. Romance ensues. Eggs are laid in clusters on the undersides of leaves, and the young caterpillars initially feed there together. Older caterpillars leave the crowd and feed solo, out in the open. One abstract from the Canadian Journal of Entomology mysteriously refers to the caterpillars as omnivorous. he same source says that YWB caterpillars are inactive about 90% of the time and spend only about 2% of their time wandering randomly in a habitat that is dense with vegetation. Because they can only see and smell plants that are within about 1 cm of them, they can’t afford to be picky eaters—any plant that they bump into is a potential food plant. A tachinid fly named Compsilura concinnata, which was introduced from Europe in 1906 to control the also-introduced Gypsy moth, turned out to have a broader palate than it was supposed to and attacked native Lepidopterans (including some Giant Silk moths, sphinx moths, and swallowtail butterflies). Mom “larvaposits”—she injects a live maggot, not an egg, into a host insect. There are several generations of C. concinnata throughout the summer, and they overwinter, among other places, in the pupating larvae of the YWB. Last week’s Green June Bug evoked powerful memories for several BugFans who have lived in the Southeastern or Southeastern parts of the U.S. BugFan Tom recalls enjoying the GJB’s doppelganger, the Fig Beetle, flying around Tucson (he has a picture of his 2-year-old with a handful of them), and he appreciated the recycling endeavors of their larvae. Almost BugFan Joe recalls GJBs in/under the piles of cow manure on the dairy farm in east-central Mississippi where he grew up. Closet BugFan Tom reports that neither GJBs nor Japanese beetles are molesting his garden in the Deep South, but he also “flew” GJBs on pieces of thread as a lad in Tennessee. So did BugFan Chris, who speculates that this “beetle-on-a-leash” thing seems to be common across the Southeast and Southwest where the beetles occur.